Yesterday, I woke up really early, due to jet lag. Because of this, by the time that we ate breakfast, I was starving. I ate a lot. Maybe too much. By the way, this breakfast is called Eggs Benedict. エッグベネディクト（英 Eggs Benedict ）は、イングリッシュ・マフィンの半分にハムまたはベーコン、ポーチドエッグ、オランデーズソースを乗せて作る料理である。Eggs Benedict is a breakfast made with ham or bacon, a poached egg, and hollandaise sauce, served on a toasted English Muffin. I’ve never had Eggs Benedict in Japan. 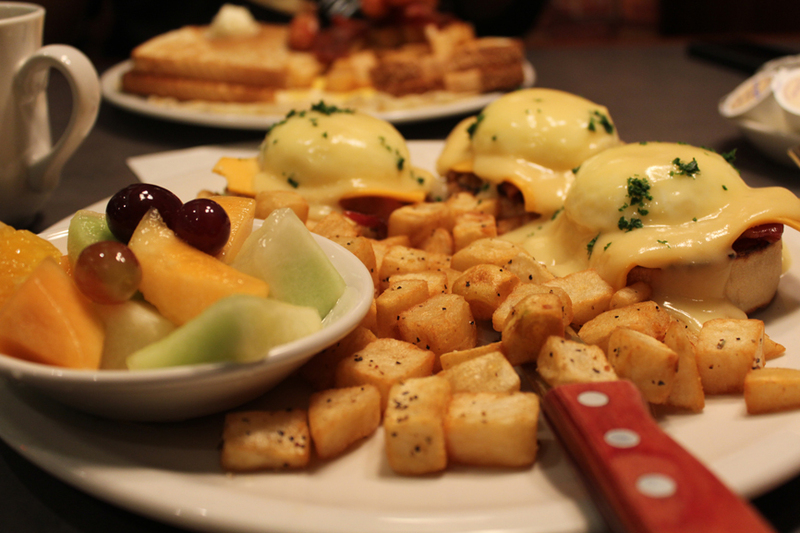 I don’t even like eggs, but I often order this in Canada. After we ate breakfast, we decided to ride the Sulphur Mountain Gondola. On the way to the Gondola, the view was so beautiful. It was cold in the morning, but because of the nice weather, we could see the mountains clearly. 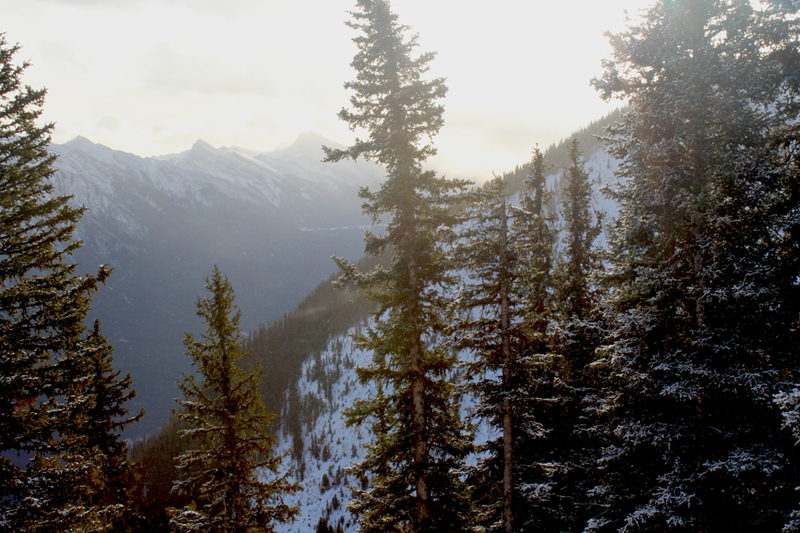 And then we took the Gondola to the top of Sulphur Mountain. It was really cold and windy, but the snowflakes danced and sparkled under the sun. The trees at the top of the mountain. And Daisuke-san seemed to enjoyed taking many pictures and videos, too. 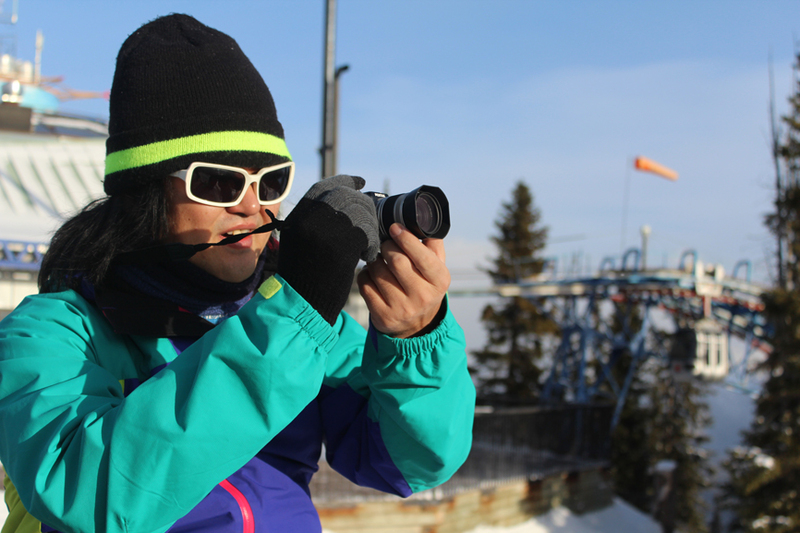 Typical of Daisuke-san, he used all kinds of gadgets to take pictures for his blogs. And on our way back, as we circled the city by car, we saw wild deer! 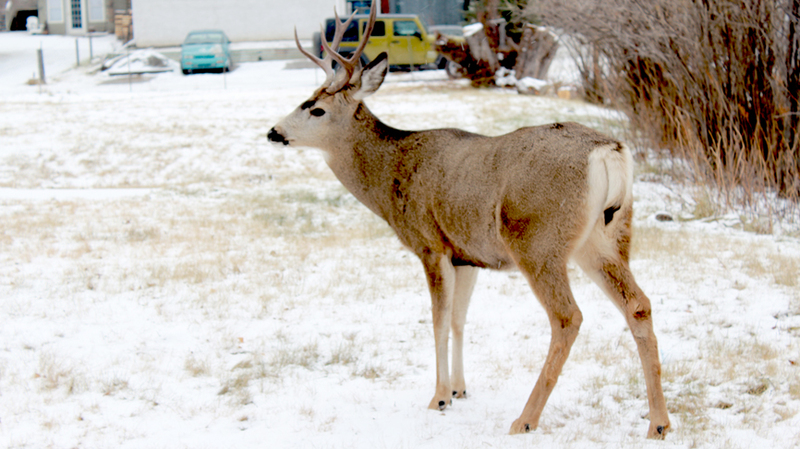 Apparently, wild deer are an every-day part of Banff’s cityscape. Because of this, the deer paid no attention to us as we walked up and took a photo. Even when we drove beside it slowly in our car, it wasn’t scared at all. When the day was done, we maybe saw ten deer in the streets. Anyway, I think I’ll end today’s blog with that. Tomorrow we check out of Banff, and go to an Ice Canyon. And then we’ll head to our next destination! +*This trip is sponsored by the Canadian Tourism Commission. Posted in Canada, Events, Food, Micaela, Tourism, TravelTagged #RealCanada, Alberta, アルバータ州, カナダ, カナダ観光局, ジェット, ダイスケ, バンフ, ミカエラ, Banff, Canada, ciaela, CTC, Deer, 観光, JetDaisuke, Micaela, Real, Tourism, travel, 旅行Bookmark the permalink. Nice!! That reminds me the days when I lived in Jasper. 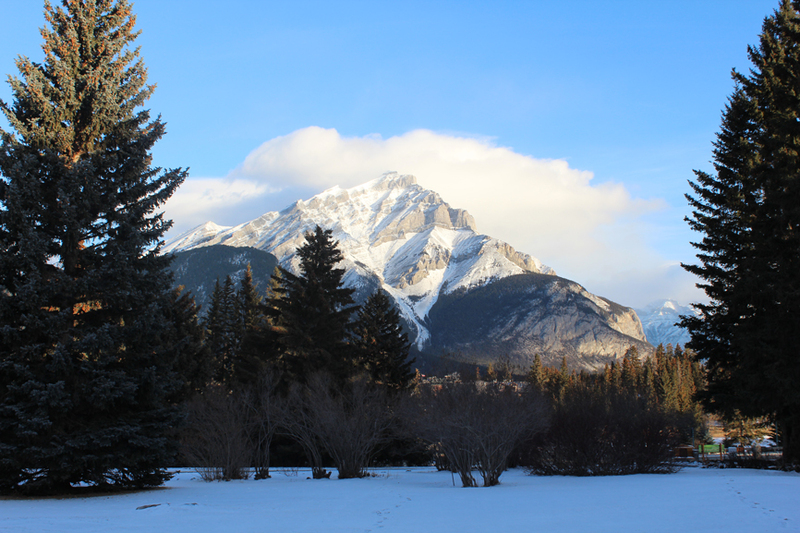 Banff is far nicer and livelier town than Jasper, though. Must be freezing out. Now, I wonder why there is no “Eggs Benedict” in Japan. I miss them. The deer is very cute! I think the ice canyon seems interesting. Will there be pictures? It looks so awesome and makes me wanna go to the snow!